Little Common Football Club will be keen to make the most of back-to-back home league games over the coming week. Common will host Saltdean United in Macron Store Southern Combination League Division One tomorrow (Saturday) and Langney Wanderers on Tuesday night (assuming the problem floodlight pylon is repaired). We’re in an okay position in the league and with two home games coming up it’s important that we take advantage of our home form. 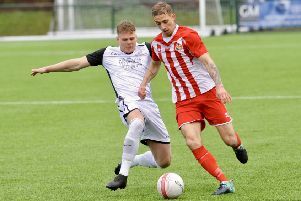 Player-manager Russell Eldridge said: “We’re in an okay position in the league and with two home games coming up it’s important that we take advantage of our home form. Again we’ll be looking to pick up maximum points where possible, but no team is going to come here and give us the three points. Common have won their last three league games and five of their last six matches in all competitions. Bexhill United, meanwhile, are now without a fixture until the visit from Mile Oak on Saturday September 19. And boss Marc Munday will be hoping the break in play will ease some of the club’s injury problems. Corey Wheeler is on crutches with ligament damage and Andy Garman pulled his hamstring last weekend.